When you come into Dominion Jewelers, you're not just ordering a piece of jewelry. You're commissioning a master craftsman to create a singular work of art. Master craftsmen bring your custom jewelry dreams to life. At Dominion Jewelers, each piece is handmade, and artisan-specific. This creates an effect you won’t get from a mass-produced piece, since extremely detailed work can’t be captured by a computer. From the actual structure and framework of the piece to touches like milgraining and finishing, the entire process is handled by the craftsman, and inspired by the customer. Share your jewelry dream with us. The first step of the process is having an idea, whether it's something inspired by existing designs or a piece that you've always had floating around in your mind. 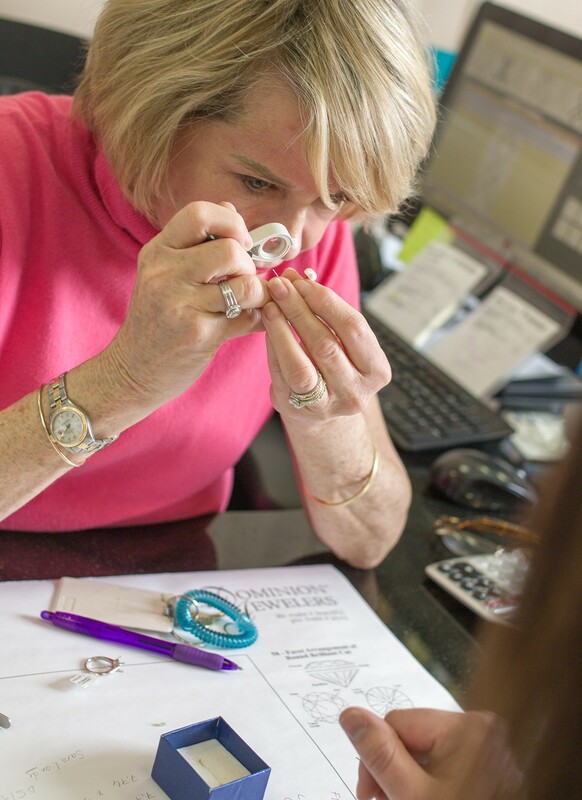 On your first visit to Dominion Jewelers, you’ll meet with a designer, who will get an idea of what you’re envisioning. You’ll review the type of stones you’re looking for, how you want the piece to feel, what metals you prefer, and the overall style of the jewelry. A preliminary sketch will be developed, taking into account the general features and some possibilities on fine details. We use the best technology to design your custom jewelry piece. From there, the sketch you approve is translated into a CAD image. * Using this system, the designer can make alterations in terms of details, settings, and placement. The design can be adjusted digitally until it reaches a point where we feel that it is ready to start physical production. Once the computer assisted design has been finalized, a wax model will be created to give you an idea of how the finished piece will look. 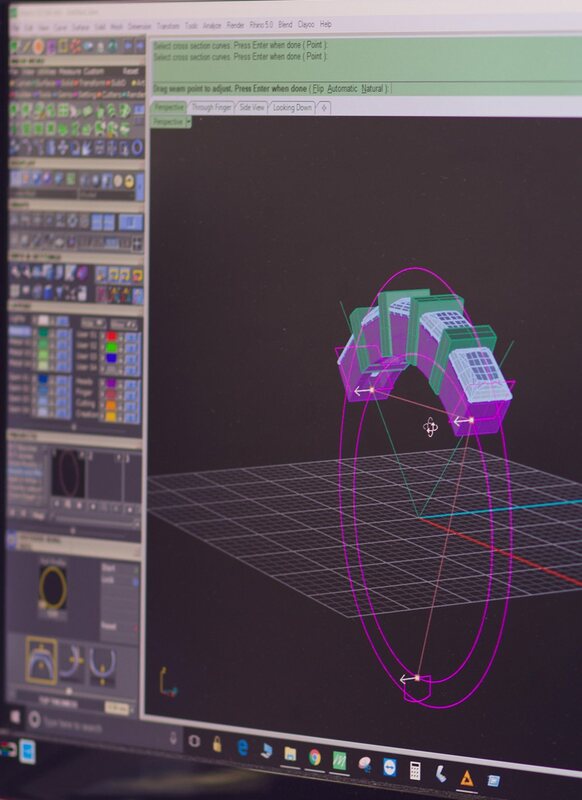 With CAD, computer-assisted design, we can show you almost exactly what your piece will look like once it's completed. So you can approve characteristics like the height of the diamond, the size of the piece, the angle of the stones, all of the detail work and styling, or make adjustments to suit your taste before the piece is actually created. This process ensures that you are one hundred percent satisfied with your custom design before production starts. The result is a piece that is inspired by your vision, and crafted by some of the finest artisans in the business. Your dream becomes an everlasting reality. The wax model will then lead the creation of the piece using actual metal. Depending on the metals used, the intricacy of the piece, and any additional gems that might be needed to fill the settings, this step in the process will likely be the longest, taking at least two to three weeks on average. The piece will ultimately be cleaned up, polished, and presented to you for final inspection. This entire process begins with you. 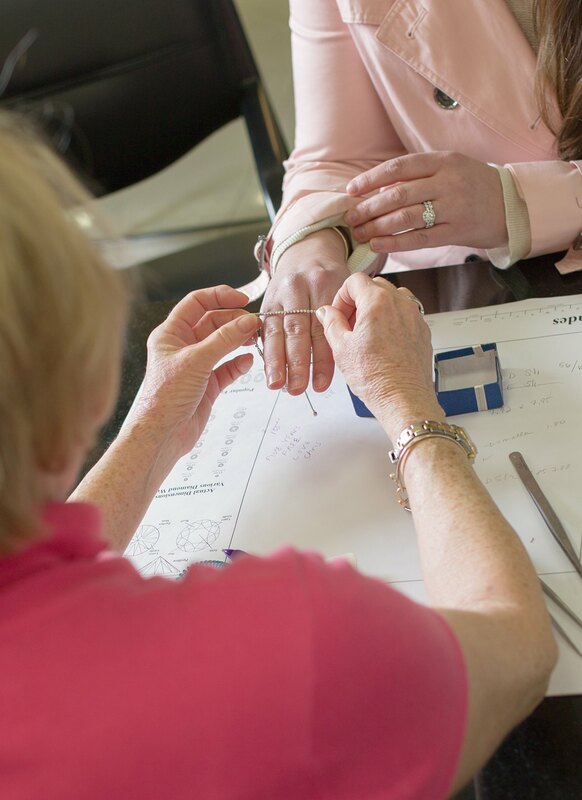 The process begins with the ideas that you have for your perfect piece of custom jewelry. It's up to us to turn those ideas into a reality, and we'd love to have the chance to do just that. Feel free to contact us either through our website if you have general question or over the phone to schedule an appointment.